Dexclock-Wallpaper Clocks are desktop backgrounds for your computer with a real-time working clock blended into the artwork. We already have this feature implemented in Dexpot, our virtual desktop manager, but because of your overwhelming feedback, we started this little project for a stand-alone Wallpaper Clock app, in case you think you don't need virtual desktops (which you might want to reconsider). And, as always, we're giving it away for free, because our competitors don't. Four Wallpaper Clocks are pre-installed. 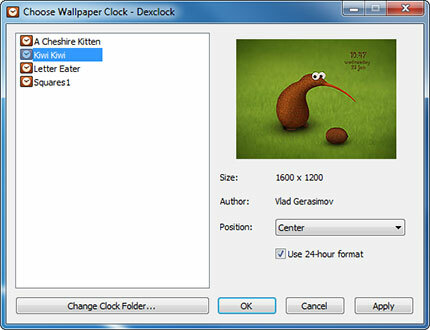 Pick 'Choose Wallpaper Clock' from the Dexclock main menu in order to set the Wallpaper Clock of your choice. Qweas is providing links to Dexclock 1.1 Build 24 as a courtesy, and makes no representations regarding Dexclock or any other applications or any information related thereto. Any questions, complaints or claims regarding this application Dexclock 1.1 Build 24 must be directed to the appropriate software vendor. You may click the publisher link of Dexclock on the top of this page to get more details about the vendor.